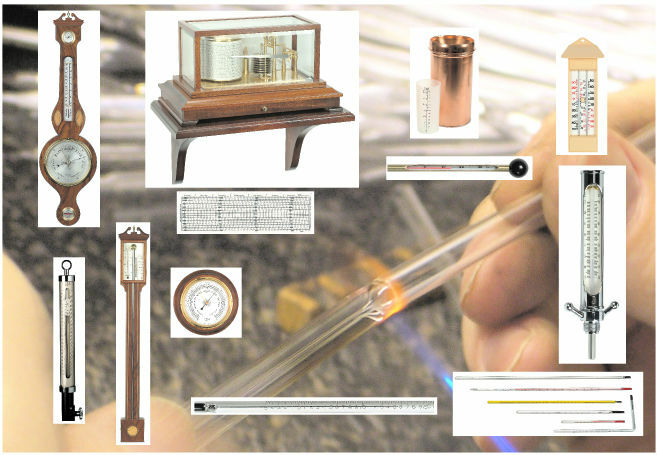 Russell Scientific Instruments manufactures precision thermometers, fine barometers and barographs, and scientific measuring instruments for a wide range of industrial, meteorological, domestic and other uses. The company stocks a comprehensive range of replacement charts, pens and inks for barographs and similar recording instruments, both domestic and industrial. The company has well over 100 years of experience in the design and manufacture of thermometers and specialises in manufacturing thermometers to customers' exact requirements, particularly when a standard product is not suitable. The company is the sole UK manufacturer of Kew and Fortin precision barometers. Patient, dedicated craftsmanship is still employed at Russell Scientific Instruments' workshops in Norfolk, assisted by modern methods and equipment where appropriate. Many of the domestic instruments are built to popular and long-established patterns and designs. All the mahogany that we use comes from sustainable sources. The company can repair barometers and renovate non-electronic thermometers including blowing new thermometer tubes and repairing or replacing damaged or missing metal and wood parts. This service is applicable to industrial products including pipe and V-frame retort thermometers and most domestic products including thermometers for Aga-type cookers. Please note that we have a minimum order value of £25 or US $50. Orders with a value of £90 or more will be checked by 3D Secure.